Nintendo introduces another product that will help them dominate this holiday season. The classic mini consoles for NES and SNES have done well for Nintendo, despite supply issues for the NES classic. With an Amazon exclusive, the company seems to want to see if the nostalgic styling alone will move 3DSXL units with their new SNES Classic Edition of the portable console. 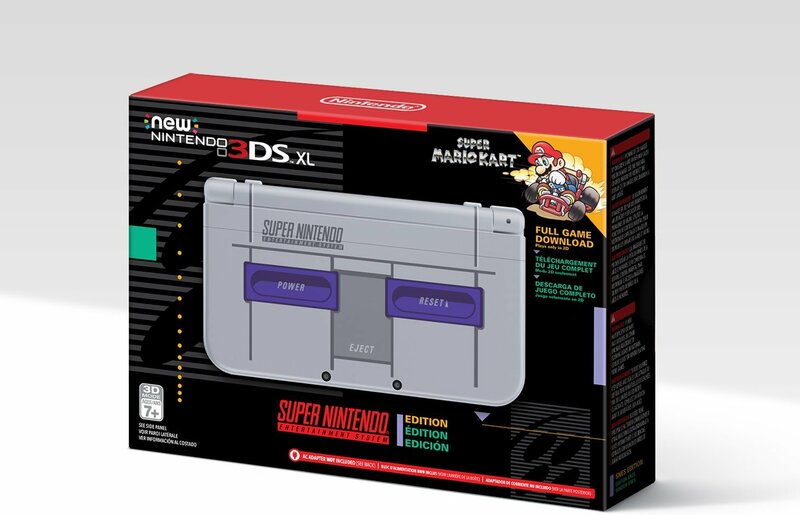 The new 3DS XL Super Nes Edition is up on Amazon for pre-order and will set you back $199.99. The design makes the back of the portable look a Super Nintendo when opened up, something someone has probably already accomplished with vinyl stickers. The packaging is even reminiscent of the recently released SNES Classic mini. This official release does come with another cool perk, though. Continuing with the classic aesthetic, all purchases of this model will come with a download code for Super Mario Kart which is one of the titles included with the SNES Classic mini. The SNES Classic Edition 3DS XL will be released on November 27 and is just another of many elements that point toward Nintendo dominating this holiday season. Oh wow Super Mario Kart as a pack in! Looks weird, I like the color scheme but not the fake console decals on the outside. Yeah, the front page picture of the opened system almost made me regret getting the Samus edition last month, then I saw the top of the system .